Xiaomi, the Chinese smartphone maker that raised $1.1 billion last month, has confirmed that it sold 61.12 million phones last year, bringing in an apparent revenues of 74.3 billion CNY ($12 billion) in the process. 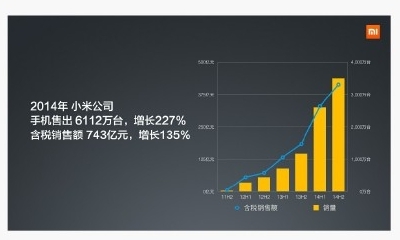 The new figures were released by CEO Lei Jun on Weibo and are right in line with the company’s expectation for the year. Xiaomi sold 18.7 million devices in 2013, and 7.2 million in 2012, so the four-year-old company is continuing to grow its business at a rapid rate — its recent funding round valued it at $45 billion and it is now the world’s third largest smartphone maker. Lei Jun previously stated that Xiaomi expects to sell 100 million devices in 2015 and, with the company doing business in seven countries in Asia right, it has developed beyond its original focus on China with greater capacity to grow its business. Lei Jun said there will be further expansions to come this year, he didn’t specific which markets but Xiaomi has been linked with new launches in Southeast Asia, and entries into Mexico, Turkey, Russia and Brazil. India has developed into a key focus for Xiaomi. There, it sold one million devices in its first five months although it was hit by a sales ban following a patent skirmish with Ericsson. That ban was lifted temporarily, and Xiaomi will need to hash out an agreement with the chip maker to safeguard its long-term future in India, and potentially other markets. Lei Jun’s post on Weibo, which is an open letter to Xiaomi 5,000-plus staff, acknowledged that China’s smartphone is more competitive than ever. Xiaomi overtook Samsung to take the top spot based on sales in China, but many rivals are chasing it. Indeed, Huawei and Lenovo are two examples of big companies that are copying Xiaomi’s aggressive online sales model in the country. With that in mind, Lei Jun told employees to “reset our attitude and reset our journey”. Xiaomi released a new addition to its sub-$150 Redmi family today, and Lei Jun said a new flagship Mi phone — which tends to sell around the $300 mark — will be unveiled on January 15. Lei Jun also pledged to continue to invest in hardware partners in 2015. As our Chinese partner site Technode reported, Xiaomi’s vision is to create a Xiaomi-powered ecosystem of 100 hardware companies. Thus far it has invested in 20, including US-based Misfit Wearables and appliance maker Midea. “We are a company that the technology industry has never seen before,” Lei Jun wrote in reference to Xiaomi’s business — which hardware aside, includes the development of its own Android software, online sales only and more. “From now onwards, every step we take is writing a new chapter in the history of the industry,” he added, hinting in no small way that Xiaomi has grand plans for 2015.